You can now vote for the Best Dressed Christmas Window in Bicester by voting on our online poll by clicking here. We hope you support the local shops and go and see their amazing windows. The Snowflake Competition has begun! As of today, 20 snowflakes have been hidden in shop windows throughout the town centre – all you have to do is find them! All forms have been sent out to the schools for book bags and the closing date for entries is Monday 27th November. Clues will be added over the weeks. Happy hunting!! If you would like to download a form, please click here. a snowflake you’ll find at this new shop within. a shop you’ll find nearby a Church. Please note: Snowflake 8 may have their shutters down on Sunday’s and in the evenings. If you cannot find number 8 you can leave the space blank and your entry will still be accepted. The Snowflake Competition is now LIVE!! Scattered around Bicester Town are 20 numbered snowflakes. All you have to do is find them and send your entry form into us at the Council Offices. 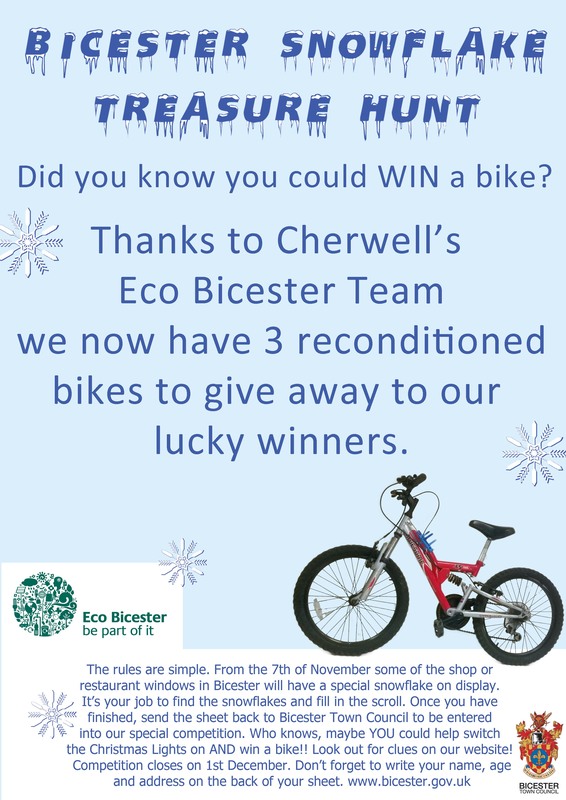 3 entrants will be picked at random by the Mayor and will each win a Kindle Fire and the opportunity to switch on Bicester’s Christmas Lights on Thursday 1st December. The competition is open to all primary school children in Bicester and surrounding villages and closes on Thursday 24th November. If you haven’t received an entry form via your school you can download one by clicking here. Alternatively, you can pick one up from our offices in Garth Park or at the customer services desk in Sainsbury’s. Keep your eye out for clues that we will add to our website over the next few weeks!! To start you off, the first snowflake can be found in the Bicester Town Council window in Crown Walk. This competition has been sponsored by Sainsbury’s and is supported by Cherwell District Council.